You came into a lump sum of money and would like to invest $10,000. The good news is at that level there are a lot of different options when you have that amount to invest. The bad news is there are a lot of different options when you have that much to invest. What will make you happy is that understanding where to invest your $10k is not as hard as many people make it out to be. When most people think about investments they think about taking their money, placing it some sort of account, and that money gains interest over time. With any of these types of investments I would only put my money here if I was planning on leaving it alone for five years or more. They will get you better interest over time that safer options, but you need time to make sure you can weather the ups and downs of the market. Betterment is a robo-advisor that allows you to fill out a short questionnaire (less than 5 minutes) and determines your tolerance for risk. They then use their algorithms to invest your money for you. Betterment also provides you with investment advice and predictions about how much you will have at retirement based off your risk tolerance. You can invest in standard accounts as well as retirement accounts. This is why I consider Betterment a great option for those looking for a good place to open a Roth IRA. For those who want a set it and forget it approach to investing Betterment is a great option. I am very interested in real estate investing. What I am hesitant about is owning and maintaining investment properties. Fundrise allows you to invest in real estate without having to maintain the property. This is done through their REITs. REIT stands for real estate investment trust. They work by allowing a pool of people to fund the trust and the trustees invest that money in real estate investments. You just sit back and collect interest. With most REITs you have to have a big deposit to get started, but with Fundrise you can start with only a $500 investment. Lending Club has become a favorite for many investors. The peer-to-peer lending network allows individuals to invest in the loans that are being sought out by other individuals. There are two things I love about investing in Lending Club. The first is that it is completely independent of the stock market. This gives us a chance to diversify outside of stocks. Second is that you can invest in a loan with as little as $25. This means that if you took $2,500 of your $10,000 investment and put it into Lending Club you could invest in 100 different loans. That way if one loan happens to default, you are well diversified inside of Lending Club. While I wouldn’t buy just one stock with my 10,000 dollars, buying several different types of individual stocks could be a good way to start earning some nice interest. For stock purchases, I use Ally Invest because their fees are only $4.95 and the research tools are easy to use. There are many other online brokerages that will do a great job for you. I will be honest, I rarely buy individual stocks. The reason is it takes patience and time to research the companies you are investing in. For me, I can get similar returns through the other channels like mutual funds and ETFs (covered below). If you are a little skittish about picking your own stocks, M1 Investing may be a great option for you. M1 allows you to invest in a bundle stocks all at the same time. What is even better is that they offer model portfolios and portfolios developed by other Motif users. You can see how those portfolios have done over time. Another great feature is that they allow you to purchase fractional shares in all the companies in the Motif. Since stocks are normally trade in whole units, you can end up only buying into a few stocks for a whole bunch of money. For example, right now Apple shares are trading at about $150 a share. You can invest in a Motif with 30 different stocks with as little as $300. That is a much better diversification in the stock market. It will only cost you $9.95 to invest in a single Motif. If you were to try and invest in 30 different stocks you are looking at paying at least $150. Not a bad deal. Mutual funds are well known in the personal finance community and are a great way to buy a lot of different stocks all at the same time. A mutual fund usually has a minimum purchase and the most common number I see is $3,000. I typically reserve purchases in mutual funds for my retirement accounts. This is because I consider them a long term purchase and keeping my money in them cuts down dramatically on fees and maximizes my retirement earnings. Exchange Traded Funds have become a very popular type of investments. They tend to have very low fees and are traded on the stock market just like stocks. This makes them super simple to purchase. The advantage of an ETF over a stock is that they follow a basket of investments, similar to a mutual fund. The advantage of the ETF over a mutual is that they trade in small units for one low price. You can purchase them just like an individual stock. Think of it like a stock account and a mutual fund got together and had a baby. That baby would be the ETF. Since ETFs trade like stocks, you can purchase them for the same trading fees, but some brokerages will let you purchase them for no charge at all. The best of them is TD Ameritrade, which has over 100 ETFs that you can trade commission free. These investments are REALLY boring, but they are very safe. You can put your money in them and get a guaranteed amount of interest. The interest on these accounts is going to be pretty low overall so they are not going to make you excited at investing in them. These investments are a great place to put your $10,000 if you need it in the next 5 years or less. I used to put high interest savings accounts and CDs at the top of my list of very safe investments, but money market accounts have decided to start offering slightly better interest without locking in your money, as of late. They work just like a savings account in that your money is immediately available and many include some limited check writing privileges. You aren’t going to get great rates, but better than you get by putting it in a bricks and mortar bank account. High interest online savings accounts hit the market almost 20 years ago and have offered better interest rates than their bricks and mortar siblings since their inception. Certificates of Deposit have fallen out of favor with pretty much all personal finance gurus. This is because, not only are they getting hit by the low interest environment, but you also have to lock you money in for a specific period of time. You can get slightly better interest with a CD, but you are probably looking at having that money locked in the CD for three to five years. You will get better rates with online CD accounts, but they are still not worth locking up your money right now. If this low interest environment were to change, CDs might become a little more appealing. At first glance, this may not seem like an investment., but hang with me. IF you have high interest debt that interest is working against you instead of for you. That means if you pay off that debt, which you are going to have to do anyway, it is like gaining all that interest back. For example, if you had $1,000 of credit card debt with an annual interest rate of 21.99% (very common). There are very few investments you can make that would pay you that much interest. For that reason it makes sense to pay off the debt. You can think of this debt payoff as if you were investing $1,000 in lower bills. Interest is not the only way to make money with your $10,000 investment. There are many other investments that can pay off big time if you know what you are doing. Many people think of real estate as a risky, but those who do the research and know what they are doing can turn a really nice profit. While your $10,000 investment will probably only help with the down payment for a mortgage, you can do well with a well-planned real estate investment. If you are looking for a resource to get started with real-estate, I like Clark Howard’s book Clark Smart Real Estate. In the current economy knowledge is power. This means that we all need to consistently be learning, either for our current career or for new income opportunities. With websites like Udemy anyone can learn new techniques and strategies in pretty much any area. Another option is to look to take non-credit courses from different colleges. Many of the Ivy league schools put their courses online for anyone to learn. No matter which option you choose the most important thing is that you gain the knowledge to improve yourself. Whether you are looking to replace your current job or want to create a nice side income, starting a side business can create a very nice stream of ongoing income. This kind of investment can be a simple as paying for the right type of insurance to become an Uber driver or buying all the equipment and supplies to start making your products for Etsy. It could also mean making the first real capital investment into a dream business that can replace all your current income. You didn’t think I would give you all these options and then leave you hanging without a strategy, did you? This is how I would invest 10,000 dollars if it fell in my lap right now. Understand, that I don’t have any debt except for my house and I have a fully funded emergency fund. I am a big fan of diversification and Fundrise gets you into real estate and away from stocks very quickly. It also keeps my overall investment in any one item at 20%. I really like Lending Club as a diversification tool away from stocks. Investing 20% of the $10,000 is a good way to accomplish this. On top of that, $2,500 would allow me to invest in 100 different notes. That provides me with a great diversification inside of Lending Club. ETF’s give you a huge diversification advantage in the stock market. I would look at some combination of index funds, health care funds, and international growth funds. You can do all this through TD Ameritrade and not pay any fees for the trades. I have become a real believer in the robo-advisor trend. Not only does the service handle all your investing and rebalancing for you, you can also see a comprehensive guide for how to hit your retirement goals. This is the reason I believe so heavily in having some of my money in Betterment and allowing their expertise to do part of my investing for me. For me this investment would go into this website. There is always something I can spend money on to make this site better for my readers. If you aren’t into starting a blog then take this investment and look for a side business that you can be passionate about. 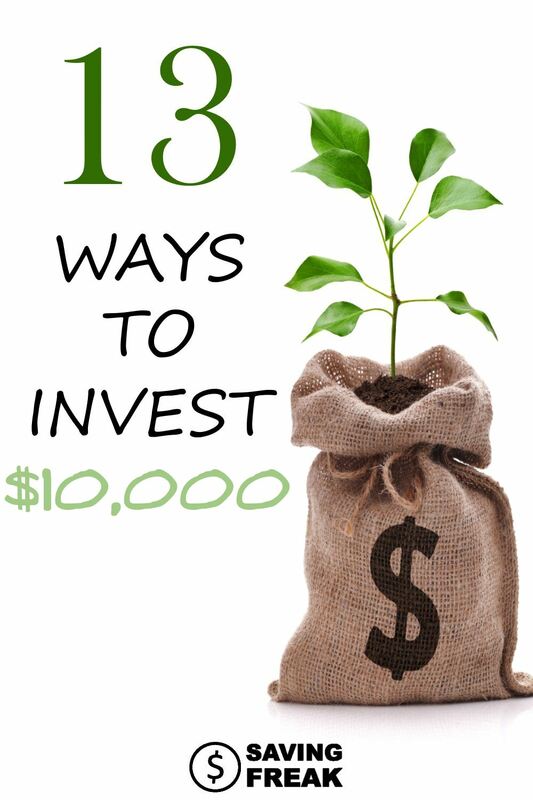 Even if you are starting out with a $5000 investment or even $100 the time to start your investments is RIGHT NOW. The more time you have for your investments to grow the better off you will be so get rolling with some of these ideas or come up with your own. Either way get on it and become a Saving Freak with a bunch of money for retirement.